Thursday night is open mic night, hosted by Marq DeSouza. You’ll never know what you’ll get, as a variety of performers drop in for a set. Everything from music to spoken word, and even stand-up comedy acts could be on stage. Performers can start signing up at 7:15 pm. There will be a sign-up sheet and it’s first come, first served! The musical showcase goes from 7:30-10 pm and each performer gets 3 songs, unless it is very busy; in that case, every performer will showcase 2 songs each. If there is time at the end, performers have the opportunity to play an additional song. Any genre is welcome, as well as stand-up comedy and spoken word! Check out our Facebook Page for the latest news and event postings. 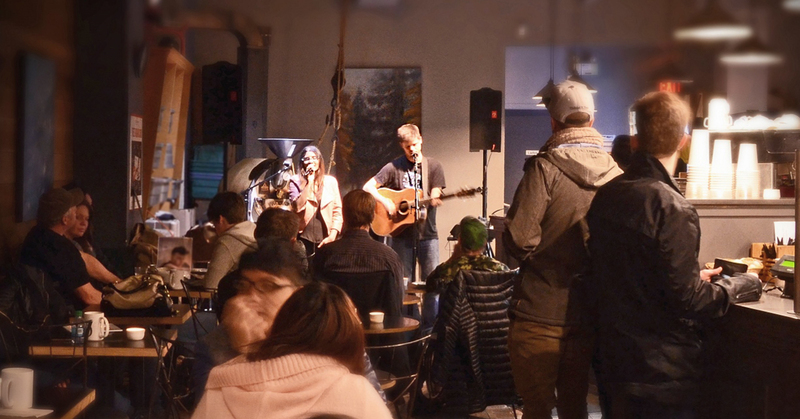 Come down to the Granville Street cafe and take in some great tunes at our Open Mic Thursdays and Live Music Fridays, while enjoying some warm ambiance and your favorite coffee drinks and maybe a little something for dessert (our famous cheesecake, anyone? ).